Samson update:(now known as Roscoe) Roscoe has been with us for a week now. He has settled in quite well. We switched him to a good raw diet. Had him to the vet for a good once over and blood work which all came back normal and HW negative! He has ear infections and some skin issues we are treating and will have him back to the vet for his neuter as soon as those issues are cleared up. He is very obedient and knows sit, stay, come, and waits until you give him the “ok” to eat his meals. ​He gets along just fine with our other female foster Shelby. Was curious about the cats at first but now doesn’t mind them unless they run away from him then he like to chase thinking they are playing. He is very playful and loves toys and is great with my 9 yr old. She just loves how big he is. Titan came to us from a Family who used him only for breeding. When their female got sick, they had no more use for him. He is heart worm positive (at a very young age) MRF has started the slow kill method of treatment. He will be re-checked for hookworms when he goes in for neutering. We were told by the Family "Titan loves dogs, he's not crazy about people". Well, with a little bit of love, his personality bloomed. He's a true lover boy now named ROMEO. He s an unbelievably sweet, people loving and people dependent little guy (Probably 180 lbs). ​He absolutely loves our 3.5 y/o Pit and our 6.5 y/o French Mastiff. He is afraid of the 14 lb Cat, go figure. His main fault is the family taught him to give Paw. He gives paw for everything, when he wants anything, when he wants you to wake up (Yes you can get a black eye) which is why I never teach a Mastiff to give paw but it is very common mistake. Romeo is a bit of a chewer, Shoes, My wife's boots, and a dog bed. He is a sweet little guy that requires a lot of attention. We have a small farm and he loves to run and patrol the perimeter he loves to run and should be with another pup. I would not recommend him for a house with small children as he acts like a bowling ball and will knock them over as he runs through the house. He's learning to get along with our horses but is a little too rough sometimes I guess he thinks they are big dogs and I am afraid he's going to get kicked. . He is a great boy one of the most lovable ones I've worked with..
Addy, short for Adeline, has been in her foster home over a month. She was part of the group from the backyard breeder, that were turned over to rescue when their human caretaker decided he, or she no longer wanted to keep the dogs. Whatever conditions she was living in, she was not mistreated, but came in with a healthy disposition and no major medical problems. Addy is approx. 8 months old. She is super sweet but she is very much a puppy. She will need .patience, rules, consistency & lots of attention. Addy loves to play but gets very vocal when no one is paying attention to her. Just like all babies she needs a lot of supervision or she may get into things she shouldn’t get into. You will very quickly learn if your house is puppy proofed. Addy is up to date on her vaccines and microchipped, but due to her young age, she is not yet spayed. She will need a lot of training and socialization. The world is still quite new to her and she has a tendency to shy away from things that scare her which is why it is so important to introduce the dogs to the world and the world to the dogs. As a puppy it is required that she receive basic training and canine good citizen training. If you have questions about the requirements, you can contact any of the volunteers in rescue. At 8 months Addy weighs just over 100 pounds. Her dad is close to 220 so she may get quite big in the next year. She is starting to understand some basic commands. She lives with 2 cats, an adult mastiff & 3 humans. She is learning to cuddle on the bed and couch with us, as well as that the crate is a temporary hangout and she gets to escape it after awhile. She walks well on leash. She loves to play and will chase balls and fetch (for a few minutes until she gets tired). She loves riding in the car. Due to her play biting, she may be too much for families with young children. She also doesn’t yet understand what toys are hers, and what toys she can’t have. I wouldn’t want her to take a young child’s favorite toy because it was left. We look forward to following Addy’s journey as she gets older. 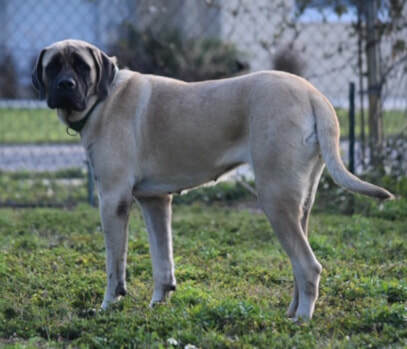 If you are interested in Addy, please realize that Mastiff Rescue of Florida requires that she go to outside training and become a Canine Good Citizen. 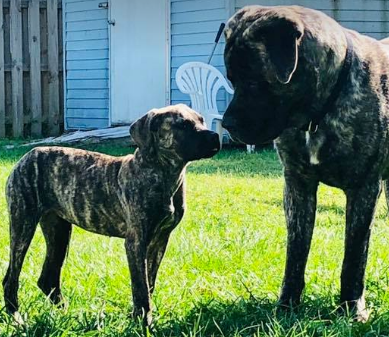 To have that wonderful mastiff companion you and the dog must go to school...it is such a great way to gain trust in each other and also to socialized. 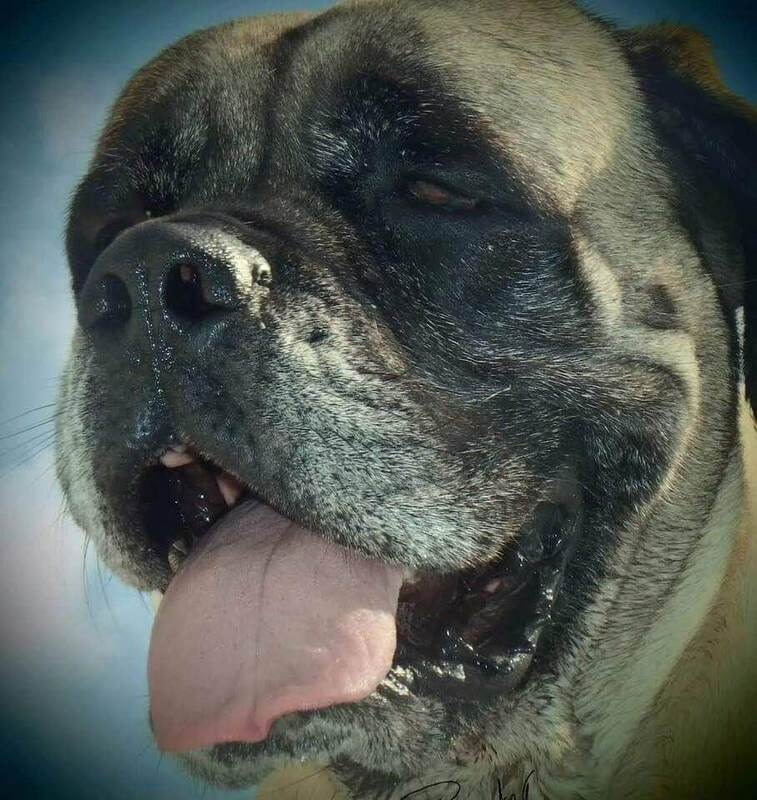 Hello, my name is Vega and I am an English Mastiff. I was named Vega because Vega is the 5th brightest star in the constellation Lira in the Northern Celestial sky and I am also the 5th member of my bright star foster family. 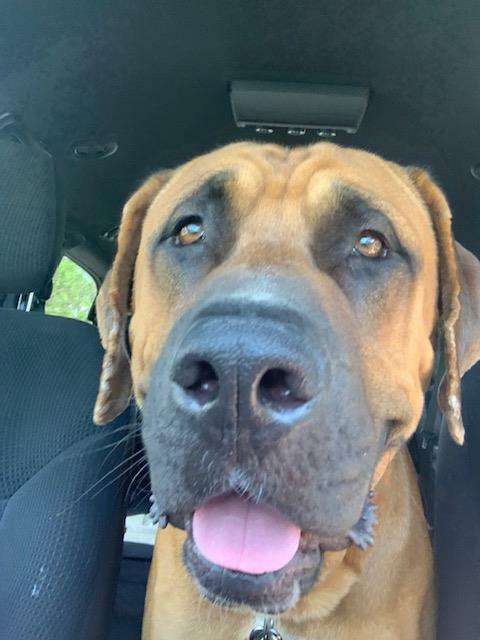 I came to live with my foster family at the age of 7 months and weighed at 82lbs. From my photos you can see that I am quite a beauty. 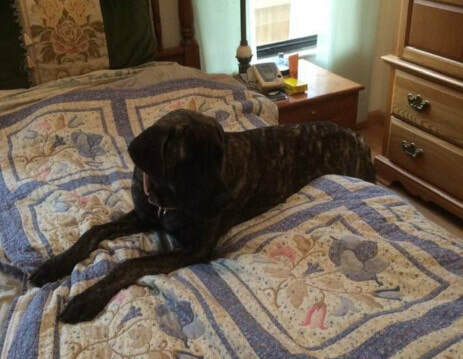 My foster parents say I am an exemplar example of Mastiff behavior: docile, affectionate, and eager to please. I am very affectionate and can never get enough lovin’ and like to give tongue baths to all my friends. They say my only vice is being sloppy while eating or drinking. I live with my human mom and dad and two sisters, one is a Russian Blue cat and the other is a German Shepherd dog. The cat is the first member of the family and the rest of us worship her. I express my respect to her by barking and whining but she just indulgently looks at me from above. However, the cat gives the same looks to the GSD too though they’ve lived together for many years. My GSD sister helped with my house training and I am proud to say that I have never had an accident in the house. In fact, I became housebroken as soon as my GSD sister showed me a doggy door. The doggy door is a great thing! I can go out whenever I want to spend time in the back yard watching birds and squirrels, listening to neighbors’ dogs barking or running across the backyard with a water can in my mouth. I know by now that the water can is not a toy and now practice running with my toys. I always come when called,have learned to walk on a leash but still have not learned to sit or stay or any other commands. I do recognize the word “no” and am always ashamed whenever I hear it because I know that I have done something to displease my family. My foster parents say I am a good girl several times a day. For being “good girls” my GSD sister and I get marrow bones or something deliciously chewable. 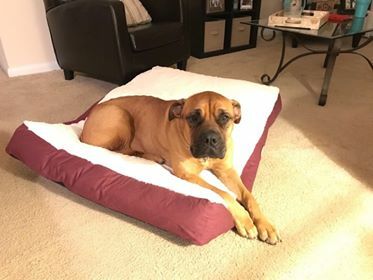 During the daytime I nap on the love seat in the living room, and at night I sleep in the master bedroom because I like to be near my foster parents, and I would definitely prefer to sleep in their bed with them. I am a little timid in new situations and my foster family is trying to help me build my confidence. My foster parents say that whomever adopts me will need to be patient with me while I get acclimated to my new surroundings that will take about 2 weeks. I need more socialization and I have separation anxiety whenever I am left alone for more than an hour or so. I would probably do better in a home that has someone there all the time. As you can probably tell from my narrative and photos, I am adorable and will make you very happy. From my perspective you must love me at least as much as my foster family. If you do I will be devoted to you for the rest of my life. She will need to be spayed once she goes through her first heat. MRF will have that done at their expense V that time comes. The adopter of Vega must understand the MRF requires the adopter to take Vega to outside training to become a Canine Good Citizen. If you want that perfect companion this is the way to achieve it. Olive, 5 years old, spayed. Olive was a backyard breeder and dumped after the last set of puppies. A wonderful man took her in and contacted MRF. 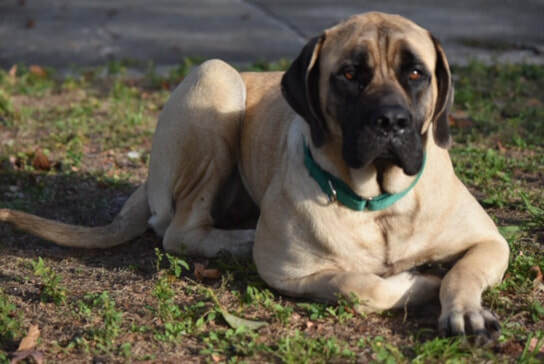 She is a very sweet mastiff that needs love and training. Her teeth have been ground down either because she was chewing on the kennel door or the breeder did it..
​Hi! I am Olive and I - - a love bug that has short spurts of energy. I spent most of my prior life in a cage and really hate to be confined so - this new life with couches, cushioned mats and trots through the fenced yard are great! I created an escape route under the fence when I first moved in but it was filled and I now prefer to be here than to try and run away. I am eating well twice a day and taking supplements that are thickening my coat and making it silky. I have had very little training but do understand a few of the basics. I am not well trained in personal space limits but do like to show affection to my foster parents and even my new sister Yara. I do not get on furniture except for the dog couch where I am allowed and am very generous sharing my drool and kisses with others. My sister Yara and I are learning how to play together and I am growing on her. I love to be touched, brushed, bathed and toweled off, having topical solutions applied or any other signs of affection. I will even help if I can to make sure you can reach where I cannot. I do not like getting eye drops, getting into the shower or walking on floors that I could slip on. I love treats of any kind, and having things to chew on that are not too hard. I am still sensitive to noises, whether from a TV, inside or outside the house, or any sudden movements but I am getting better. I am very smart and quickly learned where to find the chew treats and how to open the cabinet and pull one out for my own enjoyment. Olive was a backyard breeder and dumped after the last set of puppies. A wonderful man took her in and contacted MRF. She is a very sweet mastiff. Harley is 3 years old, spayed...Skittish, no kids for now, preferably quiet home with maybe 1 other dog . They had a fight caused by a black mouth cur over a toy though she was not the aggressor, she must be rehomed. Obedience trained, all up to date on shots spayed no chip,, no sign of aggression. Playful though skittish Jennifer says she was fine with her and very sweet. She is from a horrible backyard breeder, the same one Gracie (Chelsea) came from. Super sweet gets along with dogs and cats. She will need a foster once we spay her. She is almost 5. Look at that face!! ​Meet Maggie! She has been at our home for less than an hour and is settling in great. She clearly was well loved and cared for. I will share more over the next few days when get to know her. I’ll let you know how she is with dogs and cats as we know more. When she was dropped off she was brought with a kiddo and clearly loves and is good with kids. UPDATE: She is EXCELLENT with other dogs. She is patient with energetic 1-year old Little Foot who desperately wants to play with her. She shares her toys and beds. She doesn't let him boss her around. When she wants to be pet and he is trying to get our attention, she somehow communicates with him (without any growls or any signs of aggression) that he needs to wait and he gets the message! ANOTHER UPDATE: Maggie walks GREAT on a leash. She saw several of the cats in our neighborhood on the walk and is not interested in them at all. We have tons of squirrels in our backyard and she also completely ignores them. ​Little Jill is just a sweet baby. She sets on the couch and nervously watches our house. She hasn't done any exploring but she was caught quietly playing with her toy. She doesn't come to us but she is ok when we pick her up or hold her. She has bonded with my 12 year old boxer and lays on him. She will need to be spayed when the time comes. 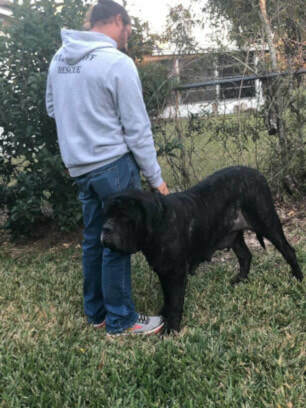 Bear was transported by his new Foster Carlos in Jacksonville. MRF thanks them many times over, We also Thank Connechusett's Vet Hosp for giving such great care. Carlos has sent a photo showing Bear relaxed in his new home. Thank you Carlos for taking him on! We look forward to hearing how it is going. the yard or be hand walked. She has a prey drive for Rabbits..
She is truly a very happy dog. Fast forward to present, owners contacted me stating they were ready to rehome Zada. let her down 2 years ago. she is your typical velcro dog. sure not to rush her into his pack. get a second chance like Zada. This gal came to us from Polk County..MRF is so fortunate to of been able to save this sweet lady. She came to us very thin and our Veterinarian wants her to put on a few pounds before we spay. She gets a long with little dogs, big dogs,cats and loves people.. Matilda always has a tail that wags and happiness in her soul. We will be posting more on her in the weeks to come. 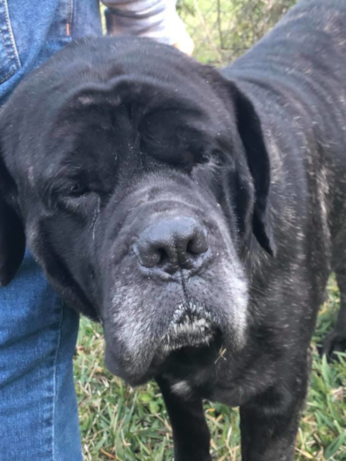 Keep an eye on this VERY SPECIAL MASTIFF. Oldie but Goodie" Brindle, 7 or 8 yrs old, heartworm positive, up to date on vaccines and neutered. We are treating the heartworms the slow kill way. What a special guy Kobee is. He has been living outside till he came into MRF. He is housebroken, loves people, is a moosh and has had several other dogs as companions. We are not sure about cats..he loves getting in bed and being loved. He needs a home for his Golden Years..he will be in our Oldies but Goodies Program...so if you might like to great companion.. ask us about Kobee.